Ferment like never before! The Grainfather Conical Fermenter Basic Cooling Edition give the brewer professional fermentation control, just like the commercial breweries. Fermentation is arguably the most important part of producing an excellent quality beer. A good fermentation environment starts with a clean and sterile fermenter, has a consistent controlled temperature base and exposure to oxygen is minimized. The Grainfather Conical Fermenter provides you with a modular system for all of this and more! The Grainfather Conical Fermenter Basic Cooling Edition includes the Conical Fermenter, Dual Valve Tap, Temperature Controller, and Cooling Pump Kit, allowing you to control the heating of your unit, dump yeast, take samples and transfer your wort via our innovative dual function valve design. Integrated Cooling Sleeve: In between the two stainless steel walls sits a cooling sleeve (also made of stainless steel). This cooling sleeve is welded onto the inner wall of the fermenter and can be hooked up to the Glycol Chiller. Temperature is dialed into the Temperature Controller and as the cooling liquid travels through this sleeve, it cools the stainless steel which in turn evenly cools the beer in the fermenter. The cooling sleeve never comes into contact with the beer, it is completely concealed, built into the fermenter and never needs cleaning or sanitizing - a true innovation for a fermenter of this scale. Golden Angle Conical: The conical shape of the fermenter is typical for professional breweries. Our conical has been designed with the 'Golden Angle' of 60º. This is the optimum angle for yeast and sediment to drop down to the bottom of the cone without getting stuck to the sides, allowing you to transfer from above the sediment level, resulting in clearer beer. The conical shape also allows for better mixing during fermentation due to the path of convention currents that it enables to occur. Dual Valve Tap: Make the yeast dumping, transferring and sampling process more professional with this innovative all in one valve. Sampling and transferring is done through an inlet above the sediment level, allowing for clear, sediment free beer. Easily collect your yeast from below the sediment level with the same unique valve for recultivating and pitching. The innovative design of the valve allows for this dual functionality and less cleaning for you. Temperature Control: The Temperature Controller easily snaps on and replaces the standard Temperature Display via magnets and pogo pins. Allowing you to accurately dial in a temperature and even set a temperature schedule/profile (you can set up to 4 profiles each with 5 stages). It can control the heating of the integrated heating element and the cooling. Support: The Grainfather Conical Fermenter is fully supported around the world by a fantastic support team who love brewing just as much as you do. Our support team is here for any technical inquiries on brewing or how the Conical Fermenter works, as well as general customer service inquiries. 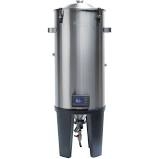 All Grainfather Conical Fermenters come with a 24-month warranty.